Set in over three hectares of rural estate, 4-bedroomed Villa Kelusa provides spectacular views, abundant living space and complete privacy. 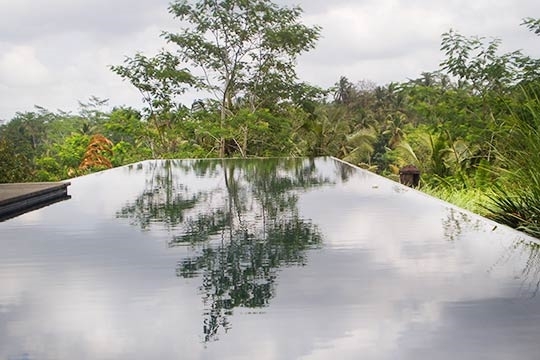 Its rice-terrace-edge, artefact-filled pavilions, two swimming pools, and delightful staff create a unique experience of authentic Bali just 25 minutes drive from Ubud, the island’s cultural heart. Bali offers stunning vistas island-wide – Gunung Agung towering above Amed’s black-sand beach, Lake Batur shimmering in the cauldera below Kintamani, the Indian Ocean sparkling beyond the revered cliff-top Uluwatu temple on the Bukit – and the breath-taking, jaw-dropping rainforest-and-volcanoes views from Villa Kelusa certainly rank amongst the best. 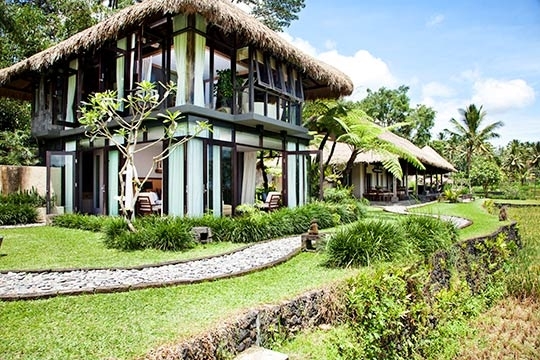 If you’re looking for an experience that captures the essence of authentic Bali without compromising on 21st century comforts, Villa Kelusa delivers in spades. The 3.1-hectare estate rests on the rim of an amphitheatre of rice terraces cascading down into the deep gorge of the sacred Pakuseba river, heard but not seen far below. Facing west, the villa has 180-degree views across coconut palms, feather-laced albasia trees and virgin rainforest, towards a string of nine volcanoes rising above the horizon. It’s the kind of breath-taking view that bewitched artist Walter Spies and luminaries of the 1930s, and is the subject of Bali-style paintings hanging in museums and galleries, from Ubud to Amsterdam. 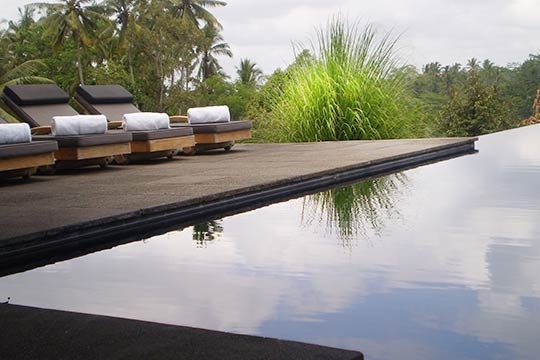 Matching this iconic essence-of-Bali view, the villa itself is equally enchanting. It was designed as a stylish, spacious and comfortable family home and is clearly cherished; bursting with character and personal touches. Its architectural ‘split personality’ gives guests lots of choice: open-sided, deeply terraced alang-alang-thatched traditional Bali-style, or ultra-contemporary glass-cube minimalism; two living pavilions, an enormous poolside balé, a media room and library; rice-terrace-edge swimming pool or second pool starting within the living room. In fact two families could easily co-exist here, each with plenty of private space. Making a stay at Villa Kelusa even more memorable is the team of long-serving staff. A reasonably priced menu features home-cooked local and international favourites, and the competent cook is happy to prepare off-menu dishes. Beyond the villa, sure-footed guests may make their way gingerly down to the river with a member of staff as guide, or stroll through the rice fields where colourful penjors flap in the wind to discourage birds, and daily offerings are left at shrines to Dewi Sri, the goddess of prosperity and rice. 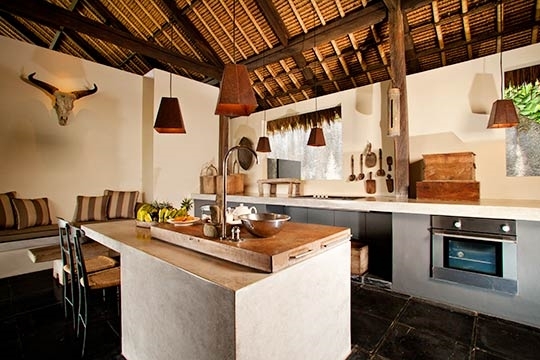 The restaurants, cafés, galleries, boutiques and spas of Ubud are less than half an hour’s drive away..
A luxuriously spacious two-pool villa capturing the essence of authentic Bali. 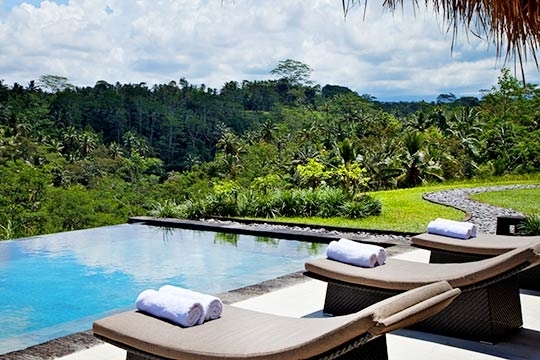 Villa Kelusa is magical, and we feel really privileged to have stayed there. When we first walked through the entrance and into the living pavilion we could hardly believe our eyes – the views are simply the best we’ve ever come across in Bali, and the way the landscape changed with each shift in the light was bewitching. After a stunning crimson sunset, fireflies glowed in the darkness, the Southern Cross twinkled high above, and flashes of lighting in the far distance revealed fleeting glimpses of Bali’s mystical mountains on the horizon. Then pulling back our bedroom curtains in the morning, we counted nine volcanoes hovering above the gossamer mist that carpeted the valley below. We loved the layout of Villa Kelusa, which works wonderfully for multi-generation families and groups of friends who like to be together but still have space to spread their wings. We haven’t come across another villa that accords such privacy and space for four bedrooms, and with three separate living areas and two swimming pools, even a crowd could get lost here. 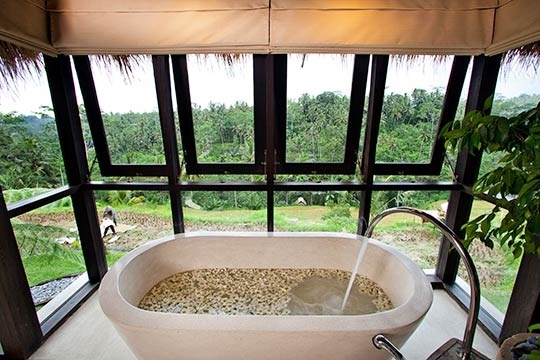 While we retreated to the fabulous master bedroom of Pondok Sapi, a contemporary glass cube with fabulous views, our honeymooning friends loved the privacy of Pondok Surya, whose romantic bedroom, starting-within-the-living-room infinity pool and sensual double bathtub were much appreciated! A special thank you to Wayan Sudana, the villa manager, who was a fount of information and enriched our stay. His delightful team hails from the local village, and many have been attached to the house from the beginning. 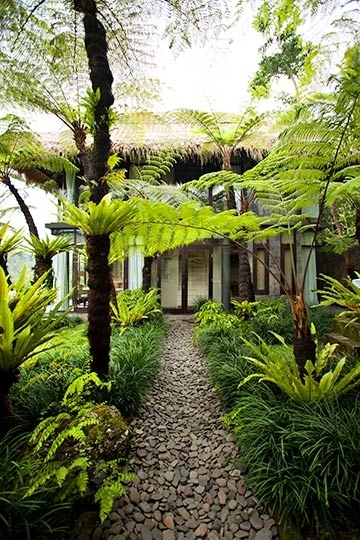 We’re just thankful the owner decided to share her delightful Bali home with us! Our entire stay was one continuing highlight – the sheer amount of living space, sense of privacy, interior décor, the staff…. and that sensational view with its ever-shifting moods and light. And we all fell for Poo the villa’s affectionate blind poodle! 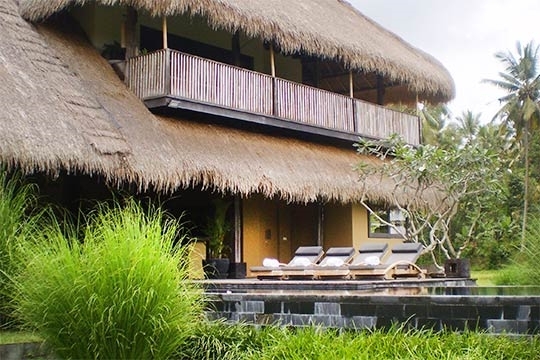 With an infinity pool flowing right into the living room, I would be nervous about accommodating very young kids in the downstairs bedroom of Pondok Surya. And parents would need to keep a close eye on kids inclined to wander, as there’s little separating the garden from the rice terraces beyond the estate. But all our other surprises were good ones. The 3.1-hectare Kelusa estate looks out across a 180-degree panorama of rice terraces that tumble down to the river out of sight far below, and across to rainforest and distant mountains; other than one residence further along the ravine, there’s not another building in sight. 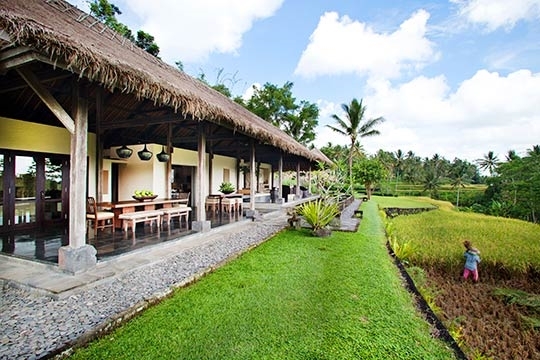 The villa is on the edge of Kelusa, a small traditional Balinese village where the rhythm of life is metred out by the sowing and harvesting of the rice fields. 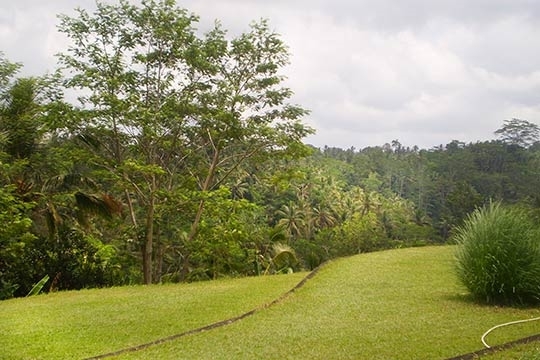 Yet while this rural idyll feels worlds away from Bali’s popular tourist spots, the restaurants, boutiques, spas, art galleries and cultural performances of Ubud are less than half an hour away. 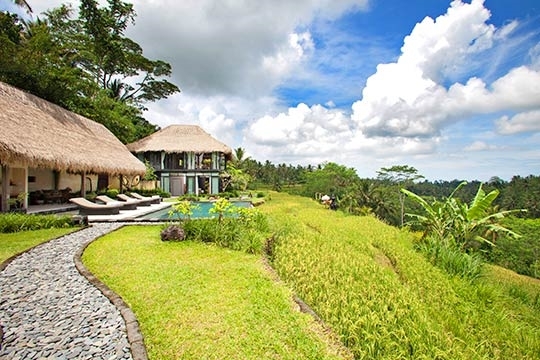 Villa Kelusa comprises a series of well-spaced single- and double-storey pavilions perched on a ridge above cascading rice terraces. 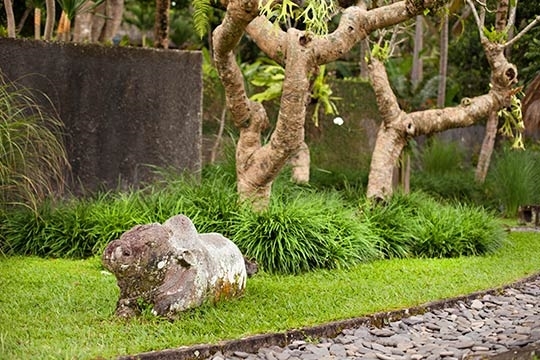 The pavilions are linked by pathways meandering through beautifully tended gardens dotted with frangipani trees, tree ferns and towering stone artefacts from Indonesia’s eastern islands. 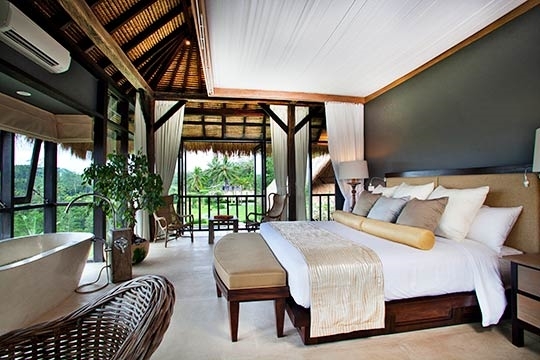 All four of the villa’s bedrooms are air-conditioned and have king-size beds. Furthest south is Pondok Surya ¬– Sunset House. 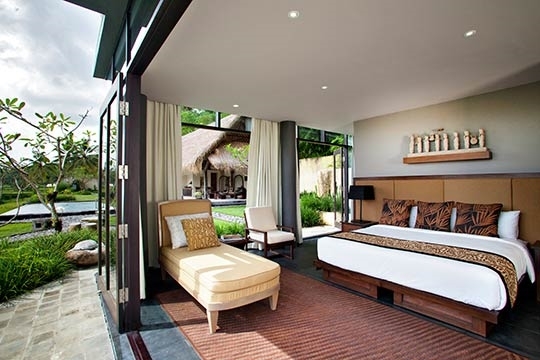 Here, the romantic master bedroom suite on the upper level opens onto a shaded veranda fringed by alang-alang thatch that frames the far-reaching rice-terrace vistas … views also enjoyed from the stately in-suite bathtub sculpted from solid wood and set before sliding glass doors. Below is a second bedroom opening onto the garden, and a galley kitchen. The long, vaulted-roof living pavilion features a seating/media area and a sit-up bar, as well as a dining platform and sunken seats within the statement swimming pool that sweeps from inside out, to hover seemingly suspended above the rice terraces. 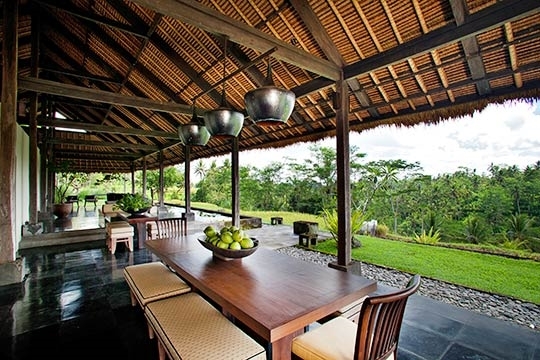 Further north along the ridge is Pondok Sapi, the Cow House – with accommodation spread across three pavilions. Edged with lotus ponds, the living pavilion contains a large dining table, breakfast bar, stylish seating and circular daybeds. Behind is a beautifully decorated gourmet kitchen, walls festooned with artefacts, offering more comfortable seating and eating areas. 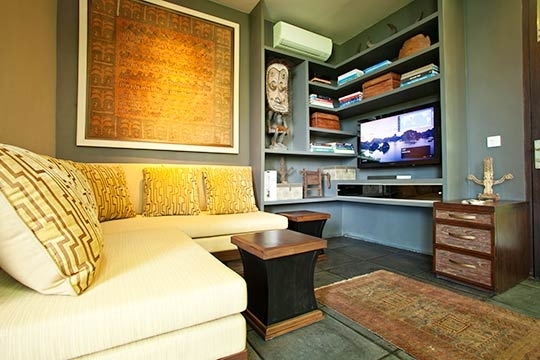 Next door is a media room that can be used as an extra guest bedroom. In the two-storey glass-walled studio – a paeon to contemporary interior design – the entire top floor is devoted to the master suite, where an enormous bed and statement bathtub are positioned to enjoy the stunning views through floor-to-ceiling windows on all sides. The central staircase acts as a divider between the bedroom and the huge bathroom and dressing room behind. Downstairs is a guest bedroom suite with great views and an ensuite bathroom with indoor and outdoor shower, and a library/TV room. 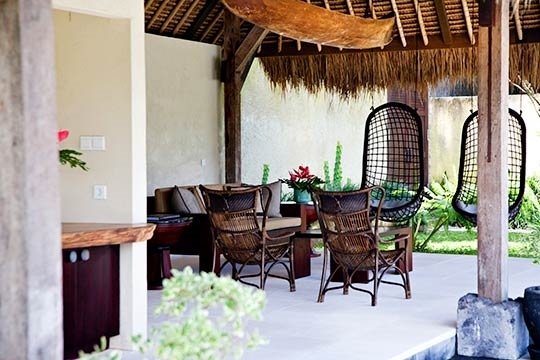 Last but by no means least is the open-sided thatched entertainment cabana with casual lounge area leading onto a sun terrace and the estate’s second infinity-edge swimming pool.